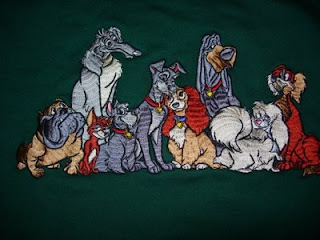 This is a "Lady and the Tramp" sweatshirt, made by the Disney Store. It features all of the adult dog characters featured in the film, including the dog to the far right, who was, if you might remember, happily led away to the gas chamber at the dog pound. This shirt was purchased a few years ago for my Grandmother for Christmas. This sweatshirt is in great condition, and is for sale for $50. 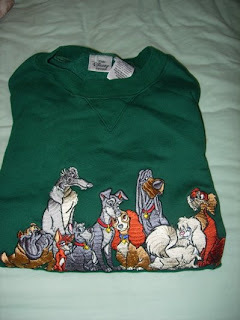 hi, I don't even know if this site is still active, but if you still have your green lady & the tramp sweatshirt could you please let me know the size? I'm extremely interested. I bought my mom one from the same collection (white, pooh & friends) on my first trip without her, as an 18 year old, to Disneyland. I just found out that it was her favorite, but the dryer ate up the embroidery. your sweatshirt is the closest I've seen. please let me know. you wouldn't happen to know where else I should look, other than ebay, do you? if I get her your sweatshirt I still want to try and find the pooh one.